Unified Heavyweight World Champion Anthony Joshua and IBF mandatory challenger Carlos Takam faced off at the National Museum in Cardiff on Thursday during the final press conference for their heavyweight blockbuster this Saturday live on SHOWTIME from sold-out Principality Stadium. 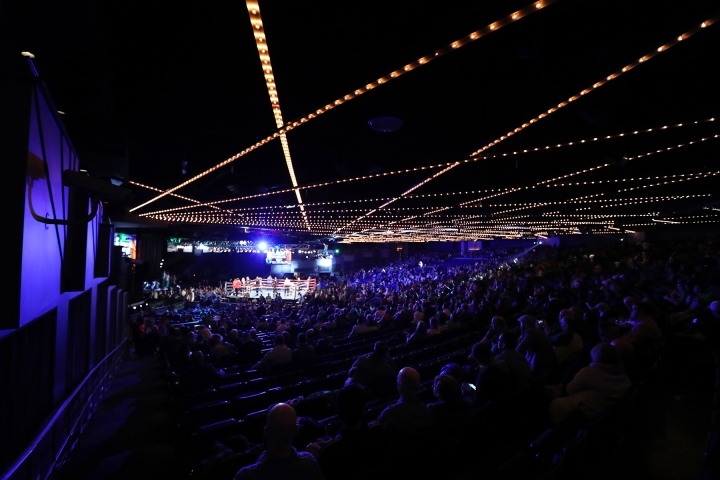 Joshua and Takam will square off in front of an all-time indoor boxing record of 78,000 fans on SHOWTIME CHAMPIONSHIP BOXING beginning at 5 p.m. ET/2 p.m. PT in the U.S.
Joshua (19-0, 19 KOs) returns for the first time since unifying the heavyweight division via knockout in a leading Fight of the Year thriller with long-reigning kingpin Wladimir Klitschko this past April. “We’re going to have to put that Klitschko win to the side at some stage because boxing is unforgiving,” Joshua said on Thursday. “That was that. This is now. Carlos is a completely different animal than Klitschko. Takam (35-3-1, 27 KOs) has experience in close bouts with reigning WBO Heavyweight Champion Joseph Parker and former challenger Alexander Povetkin. The 2004 Olympian from Cameroon enters the contest having boxed more than three times the professional rounds as Joshua. Joshua and Takam meet 24 years after Lennox Lewis and Frank Bruno squared off in the first all-British heavyweight world championship in front of more than 25,000 fans at the National Stadium in Cardiff. There will be more than 78,000 at the new National Stadium – Principality Stadium – on Saturday.